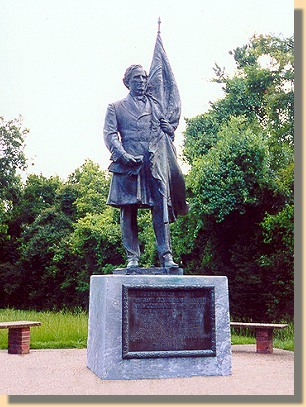 The Second Texas Lunette , named after the Second Texas Volunteer Infantry that garrisoned it, was a Confederate Fort designed to guard the Baldwin Ferry Road to Vicksburg. On May 22 the Lunette was the subject of repeated Union assaults. After the assaults, the Second Texas Commander said that the bodies lay so thick that you could walk two hundred yards down the road without ever touching the ground. The Federals started mining operations against the Lunette but had not completed them at the time of the surrender. repulsing the assault of Osterhaus's division on the line to its left. the defense cannot be accurately stated. Brig. 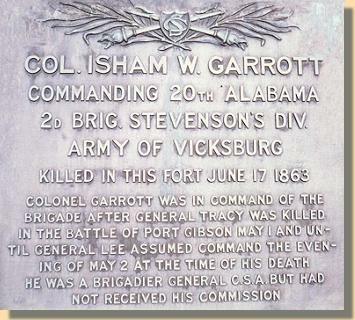 Gen. Alvin Hovey commanded the Union forces opposing Fort Garrott. His infantrymen, working under cover of darkness, dug two approach trenches which joined near the Fort. 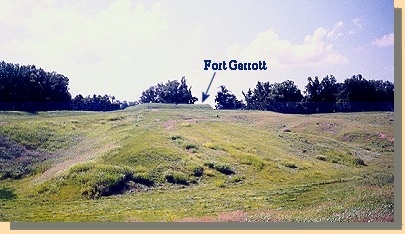 After connecting the two approaches, the diggers inched forward behind sap rollers (giant barrels covered with cane) to within 10 yards of the fort before the surrender of the city ended all action.